My wonderful wife volunteered me to speak at Rotary. It was an after breakfast talk, so I got up much earlier that I normally would, and maybe the earliest have got up all year. So as a reward I purchased my lunch today - Sushi. This is my treat at the university when I have worked hard all week, or some other special occasion. I was thinking as I enjoyed my salmon and wasibi (actually horse radish + green food coloring cause it was the cheap stuff) that healthy purchased food hasn't been around very long. I can remember the early days of the wellness revolution where it was impossible to purchase a healthy lunch. All there was available was bakery food, something deep fried or a burger. 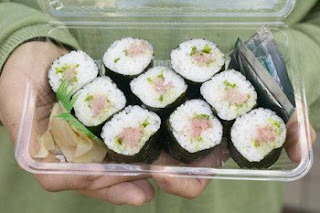 Now Sushi is common place...... at what point did it move from novelty to main stream? I can't tell you but it has clearly made the jump. The Sushi store at Uni is always busy, sushi stores are in most suburbs. It is commonly accepted that people by sushi for lunch. Now sushi is not the "perfect" food because it has white rice. But the seaweed, salmon, vege's, fish etc is infinitely better than a white bread roll or a fatty mince pie, or a burger and chips. Yes the raw ingredients for sushi is likely to be less nutritious now, than 100 years ago due to industrialisation of the processes used to create the ingredients. That all said it is a huge leap forward.